Help : The Business Partner Group window allows you to define the accounting parameters at a group level. If you define the accounting parameters for a group any Business Partner entered using this group will have these accounting parameters automatically populated. You can then make any modifications necessary at the Business Partner level. Help : The Business Partner Group Tab allow for the association of business partners for reporting and accounting defaults. Price Match Tolerance PO-Invoice Match Price Tolerance in percent of the purchase price Tolerance in Percent of matching the purchase order price to the invoice price. The difference is posted as Invoice Price Tolerance for Standard Costing. If defined, the PO-Invoice match must be explicitly approved, if the matching difference is greater then the tolerance. Example: if the purchase price is $100 and the tolerance is 1 (percent), the invoice price must be between $99 and 101 to be automatically approved. Help : The Accounting Tab defines the default accounts for any business partner that references this group. 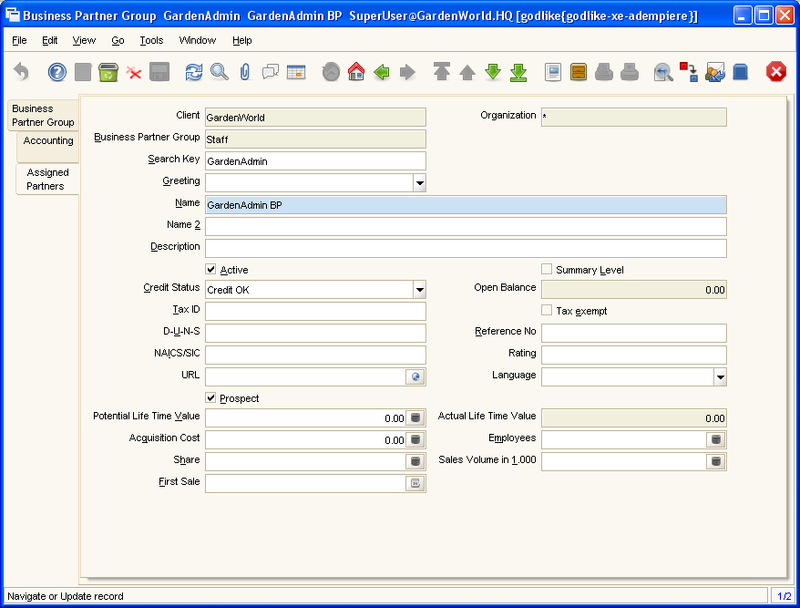 These default values can be modified for each business partner if required. The Business Partner Group (BP Group) is optional. If you do not have a BP Group set up then you will need to define all aspects for each Business Partner (BP) set up. Here you define the different types of groups that you will want to classify your Business Partners. For example, you want to classify Business Partners as Car Hire, Employee, Potential Clients, Confirmed Clients, etc. 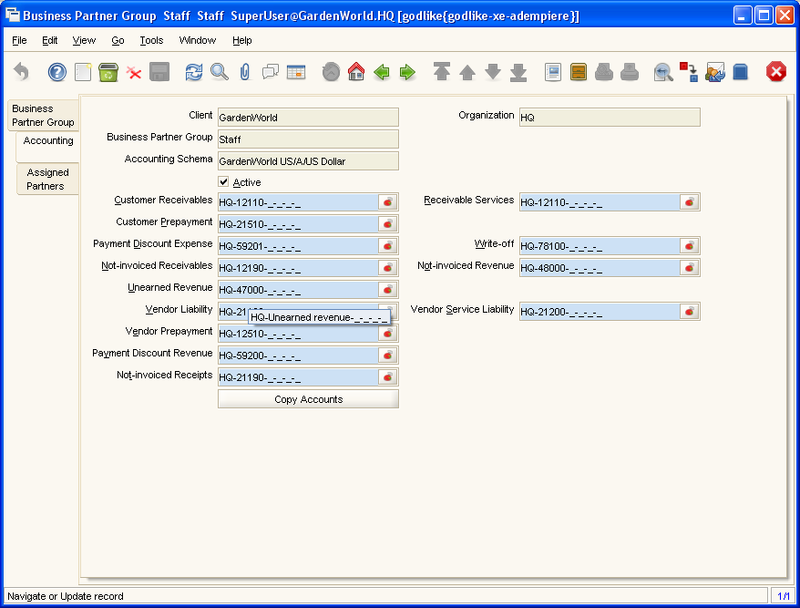 The Business Partner Groups also allow you to define various defaults. These defauls are then used when you create a new partner or if you change the partner's grouping. The defaults can be changed if necessary for the individual partner. If you elect to create a new BP Group, then there are certain fields that are required to be defined. The Priority Base is used in conjunction with requests. There are two priorities on a Request; Priority (the Request Priority) & User Importance (the priority assigned by the Business Partner). 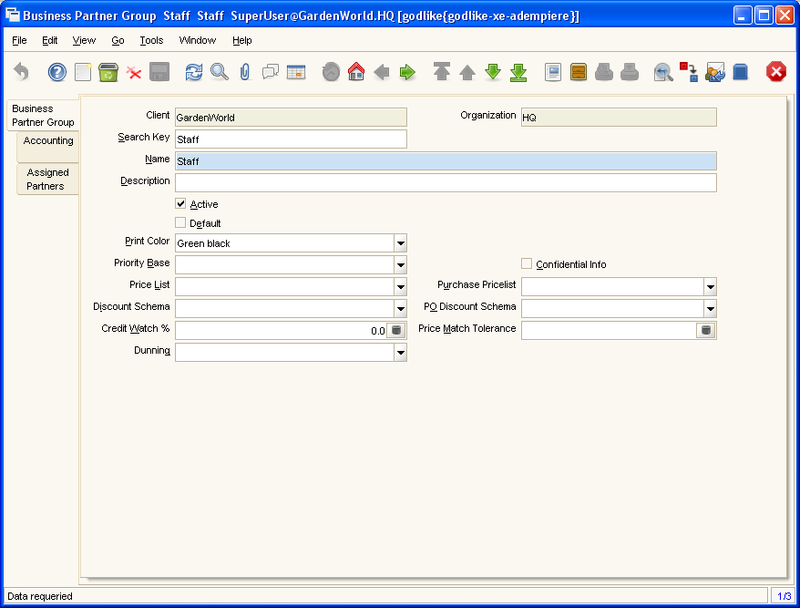 Numerical values are used when stored in the database. The Priority Base in Business Partner Group can be High (H), Low (L), Same (S), or null. The default value for the Request Priority is derived from the User Importance (entered by the BP via the web) adjusted by the BP Group "Priority Based" accordingly. If the Priority Base is "Same" or "null" then no change is made. The reverse occurs when Priority Base is High. If the derived Request Priority is higher than "High" (i.e. it's "Urgent" (1)) it is set to "High" (3). At the other end, if the derived Request Priority is lower than Low (i.e. "Minor" (9)) it is assigned the value "Low" (7). Also if the Request Priority is "null" (which could only happen when creating the Request via the web as it has a default in the swing UI) the Request Priority is assigned the derived value calculated as described above. However, if the Request Priority HAS a value (is not null) then it will only be assigned the new derived Priority if it is higher (numerically lower) than that already defined. Thanks to CROO for his input. A BP in this group is able to enter confidential information when creating web requests. The code has been reviewed for the use of the Confidential Check Box and no references can be found. Therefore, currently it is not used. Further note, the web interface for creating requests always assigns Partner Confidential level to the Confidentiality field. Price Lists are used to determine the pricing, margin and cost of items sold to a business partner. This is our price list that we will provide to the BP to purchase from us, ie sold by this client & organization. This differs to the Purchase Price List. See next section. See Price Lists for further explanation on creating, maintaining and interpretation of Price Lists. Identifies the price list used by a Vendor for products purchased by this organization. That is, this Business Partner Group (vendor group) will sell to this client and organization. This is different to Price List as explained above. (??? need an example explaining this concept ???) See Discount Schema section for explanation on creating, maintaining and interpreting. The PO (Purchase Order) Discount Schema defines discounts that this business partner group allows you. Settings on a Business Partner level will override this selection (and usually you would do this on a Business Partner level). At what % of credit used will the credit control shift the BP to Credit Watch. This represents an allowable % change in the difference between the Purchase Order (PO) price & the Invoice price when matching the PO & Invoice. If the difference is outside this range the Match document must be approved. Dunning is the creation of letters for overdue accounts. You can define different dunning types (escalation rules etc.) in ADempiere. Selecting a rule will determine when an account is overdue and an appropriate letter is to be generated. If you have defined a Business Partner Group then this will be created automatically. You can then elect to make changes to any of the accounting aspects for the group. Note: Even though the accounts are set up here, they can still be changed on an individual basis when creating a Business Partner. This is greyed out and not possible to change, as it is taken from the BP Group that you selected in the Business Partner Group screen. This is greyed out and not possible to change, as it is taken from the BP Group that you selected in the Business Partner Group screen. It's the BP Group that you are currently working on. This is greyed out and not possible to change. This information comes from the initial client set up where you have selected the accounting schema and currency. The field is marked as required, as it should have at least the value that has been defaulted. By pressing this button you elect to replace all accounts currently assigned to your Business Partners in this group. Including any that you have manually changed. It will also set these values as the defaults to the Accounting Schema. It will also, reprocessing any details that have been posted to these accounts. A pop up window will appear asking you to choose the Business Group & Accounting Schema. Selecting this tab will show you which Business Partners have been assigned to this group. You are also able to select a business partner to edit. The editing will happen in situ. Explanations of the fields can be found in the Business Partner section. This page was last modified on 10 May 2008, at 01:46.